Orientation and mobility (O&M) refers to the set of skills a person who is blind or visually impaired uses to move safely and purposefully through the environment; basically, the ability to get where you need to go. Orientation refers to a person’s mental map and understanding of the area he or she is travelling in. It involves directionality, using the remaining senses to gain awareness of the environment. Mobility refers to the ability to safely travel. Most people who are visually impaired and seeking employment have had training in O&M by certified, university-trained instructors. Some people find additional O&M training helpful to facilitate learning the layout of a new building, the route to a new employment setting, availability of public transportation, etc. 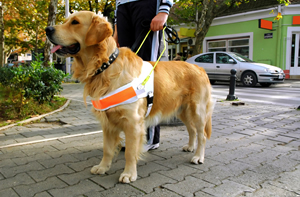 There are several preferred methods of travel for the legally blind. 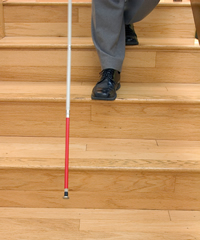 These include the long white cane, guide dog, or various electronic travel aids that can indicate obstacles.